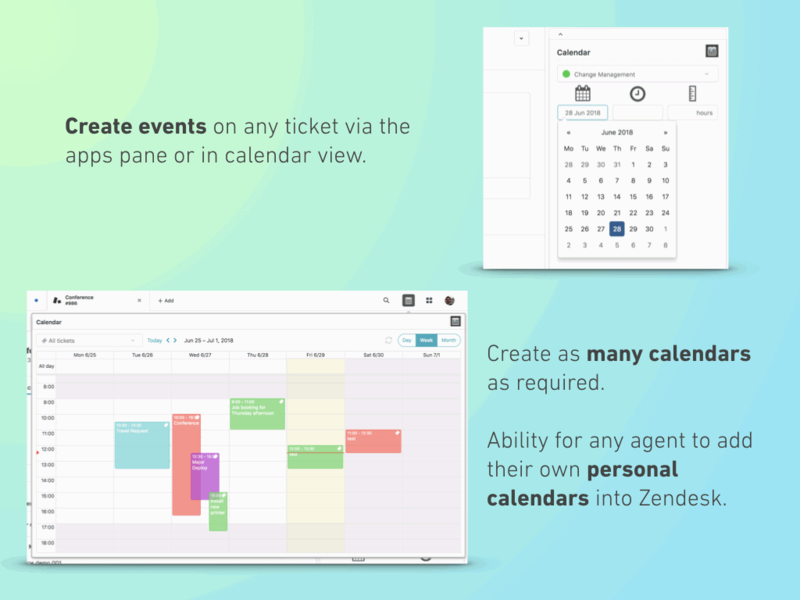 Turn Zendesk into a scheduling machine and leverage the power of Zendesk: views, triggers, macros, etc, to create powerful communication or escalation workflows around your events, while at the same time improving visibility of when things are happening across your teams. Easy to use: the Calendar app is optimized for agents to schedule events visually and with minimal effort. 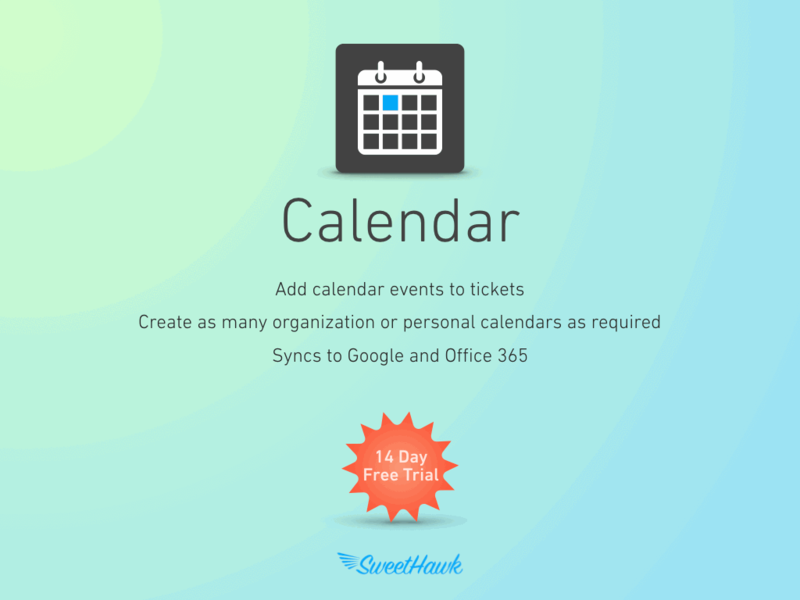 Quickly create a new ticket with an event or add an event to an existing ticket by simply dragging out a time on a calendar. Create as many calendars as you need. Specify permissions so only specific users, groups and/or roles can see calendars and control who can create and modify events in them. 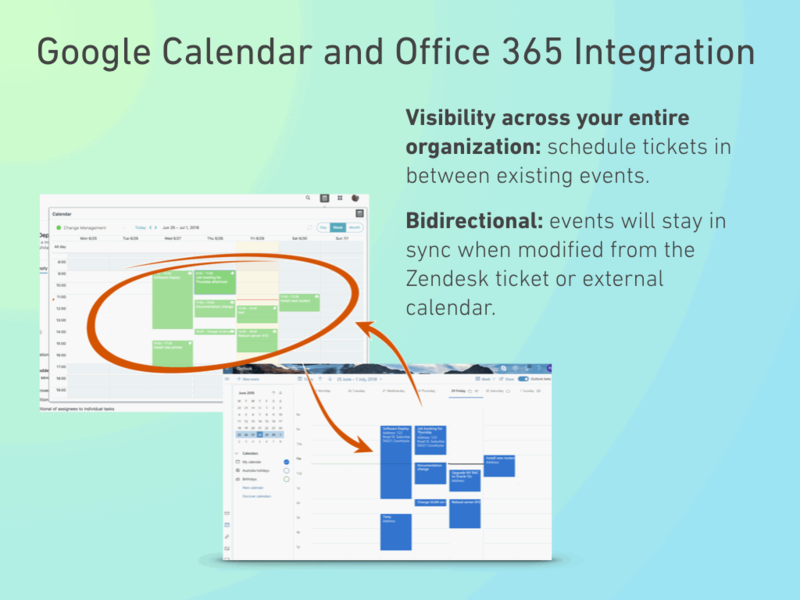 If you use Google Calendar or Office 365 within your organization, you're in luck: we have full-featured integrations with both. This means that when scheduling events, you'll be able to avoid overlap with any existing events that may have been scheduled already outside of Zendesk. It also means that should any changes be made to ticket events in Google or Office 365, that those changes will reflect back onto the ticket. With the Calendar app, you don't need to think about timezones. Your agents will view, create and edit all events their own timezone. Others will view and/or edit those events in their timezone.